In attendance this weekend, will be two young winemakers who have soared to the top of California’s most revered Rhône producers over the past decade, Matt Trevisan of Linne Calodo and Justin Smith of SAXUM. Those who have followed their rise will know that Linne Calodo was founded by the two winemakers in the late 90’s when they were in their twenties. Justin eventually left to start SAXUM and Matt Continued with Linne Calodo, later building one of the most iconic wineries on the Central Coast. The two men remain close friends and in my opinion, the brightest points in West Paso. To understand what is really happening in Paso Robles, specifically the Westside, you have to understand what Justin and Matt mean to the area. Last July, while working on features for both Linne Calodo (read those here, here, and here) and Saxum (read that here, one more soon), the topic of West Paso and why it is so special to each of them came up. I saved these comments with the intent to feature them together, which I think is fitting. With so many thinking about Paso this week, it is equally fitting to feature them now. If you are coming to Hospice this weekend with a desire to learn more about West Paso wine, the comments below are a good place to start. The following statements came from two interviews held on July 9th 2011, first with Matt Trevisan while atop Cherry Vineyard, and second, with Justin Smith a few hours later while buzzing through James Berry Vineyard on an ATV. ALP: Why do you think West Paso is so special? MT: “Paso is still super young. I think what’s happening is we are watching a bunch of Rhône verities being planted at all of these different sites. These vines are still so young. You’ll find out from Justin that his big Rhône planting, all of the terraces, were planted in the [early] 90’s, the rest was planted in 95.’ So you’re only looking at 15 years, the roots are just [now] getting to sink-in. A lot of the plantings were done in the late 90’s like 98′ and then 2000 and they are just starting the transition. The innovation in winemaking doesn’t happen overnight, it happens over decades. Those wines are just now starting to take form and people are being turned on to them. There will also be the whole thing that’s happened already in Napa, where second and third generation winemakers perform more like they do in Europe. I think the [children of winemakers] are raised with an innate quality of looking at how you should farm. ‘This is what’s best to do and we will be ok with that storm coming in,’ or, ‘this is what we need to do with this wine [to correct it] and we’ll be fine.’ It’s not a stressful thing for them. They are not sitting there with a four year degree in enology, so now that makes them a winemaker. They are doing it because they grew up with it from childhood. Matt, who originally hails from Escondido California, has now spent more than half of his life living in San Luis Obispo County. He moved there to attend Cal Poly (where he and Justin met) and he never really left. Justin’s story is a bit different. In the early 80’s, when he was still a kid, Justin’s parents bought the property that would become James Berry Vineyard and moved there from Encinitas California (interestingly less than 15 miles as a crow flies from where Matt grew up). Justin is one of the few winemakers in the area that spent his childhood on the land he know farms. He is a second generation farmer and winemaker. When we met with Justin that afternoon, he echoed many of the same sentiments about Paso that Matt did. He pointed to the age of some of James Berry’s rootstocks, some 30 years old, as a huge contributor to the complexity of Saxum’s wines and that as the vineyards in their neighborhood got similar age on them that we could expect to see the quality of the wines produced in the area continue to climb. If the quality of James Berry fruit is an indication of what older vines can do, it bodes well for West Paso. But the success of West Paso is about much more than the age of the vines Justin told us. JS: “It’s a culmination of a lot of things,” he responded when asked what makes his neighborhood special. “It’s us in the vineyards figuring out what varieties do well in what spots. We’ve got these rolling hills, north slope, south slope, low spot, hilltop, there is a lot of different microclimates involved. So figuring out what variety does well in what spot [is important], then, in the winery figuring out when to pick and vinify them. 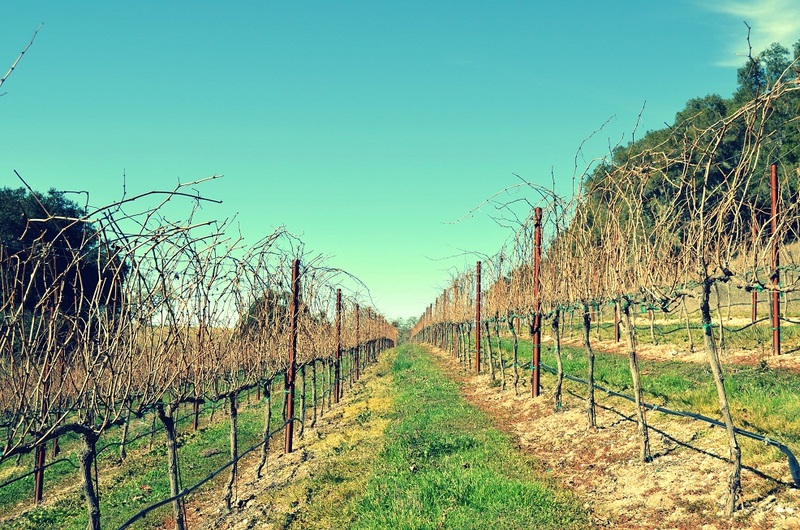 (It is an important distinction to note that Paso Robles is a huge AVA covering something like 26,000 planted acres and growing. It is the size of some Counties, spanning from South of Santa Margarita to North of San Miguel, to the West of Lake Nacimiento and East past Shandon. Do you know where Shandon is? Yeah, me neither. When Justin talks about the “little pocket” they are in, he specifically means his neighborhood of the Willow Creek area. This would include the properties of Linne Calodo, Denner (which is across the street from SAXUM’s James Berry Vineyard), Booker, Cherry Vineyard, and a few others). “It’s definitely a movement,” he continued. “West Paso is very similar to the music movements in different cities. Whether it’s Seattle or Portland, you get these little pockets like in Austin, where you have all of these collaborations and then all of a sudden they have their own sound, their own thing going on, and off it goes into the world. I definitely think something like that is happening here. The above comments are amongst my favorite that I have ever featured on A Long Pour. There is a purity to them, a simple truth. There is a “this is who we are and where we are going” sense to them. There is one final thing relating to Matt and Justin worth touching on. It has worked out well. Without the split, we would not have Linne Calodo the way it is today and we would not have Saxum at all, two of the strongest and most deeply personal projects I know. Matt and Justin love what they do, they embody it. The reality is that they are both doing what they originally set out to do, prove what Paso was capable of. Because of the efforts of Matt and Justin, the World is paying attention to the sleepy little town of Paso Robles with greater interest than ever before… and so should you.